The fiat 500 is an incredibly popular vehicle with its low tax bracket and great fuel economy from all the available engine variants. This particular Fiat 500 Remap took place in Leeds on a 2014 1.2i 8V petrol model. It is well documented that some Fiat 500 models were subject to sluggish performance when ascending on steep hills, this has now been addressed by Fiat and a software fix is available for those affected vehicles. This particular vehicle has had recently had the update done and now also benefits from one of our vehicle specific Fiat 500 ecu remaps. 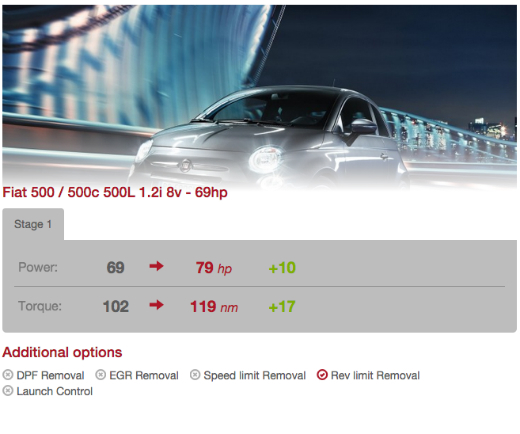 The standard Fiat 500 1.2i 8V rolls out of the factory with 69 BHP and 102 NM of torque. With our engine ecu remap those figures rise to 79 BHP and 117 NM of torque. That's approximately a 16% increase in both areas. That's a great improvement on the standard power figures and makes for a far better driving experience. With smoother power delivery and improved throttle response the engine ecu remap helps get the Fiat 500 moving from a standing start too, making for a very nippy little machine. Along with these great power gains comes better fuel economy also, this is achieved by getting the vehicle to its cruising speed quicker and smoother which means less time is spent accelerating and wasting fuel. With Fiat 500 remaps available from as little as £199.00 it's a very affordable and rewarding investment. Should you wish to discuss your Fiat 500 engine remap then please feel free to contact us. Should you wish we can perform your engine ecu remap at a time and place to suit you in Leeds and surrounding areas including: Bradford, Harrogate, Wakefield, York, Brighouse, Castleford and Sheffield.